This was our fourth year having a long weekend in February at Barr-Beithe Upper cottage. It has always been quiet and peaceful with a fabulous outlook over Loch Awe and surrounding hillside. The mature and well maintained garden and adjacent fields attract a large variety of wildlife, including deer, red squirrel, woodpecker, song thrush, birds of prey, etc. We have always enjoyed the quieter and more relaxed pace that this cottage and location offers. Catriona has always been welcoming, helpful and available should this be necessary, and has always respected our privacy. Over the past four years we have been impressed with the quality of the accommodation and facilities and all the changes that Catriona has introduced in relation to home improvements. It is evident that Catriona takes pride in ensuring that Barr-Beithe Upper is maintained to a high standard. Stunning place, highly recommend! Fabulous Cottage good size , nice and cosy, great for a family break away - enjoyed by all! Very peaceful, and to get explore the walks- bliss! Great accommodation , really well equipped more that we needed . The owner lady Catriona was very kind and helpful with either way . We were so lucky with the weather because wasn't too much rains . What a fabulous property,spacious & well maintained with fantastic views from every window. Even when the weather turned foul,it was great to be inside,in the warm with views of the approaching storm. The owners were just perfect,helpful & informative.If you want a peaceful holiday,away from working life with gorgeous views & surrounding areas you’d be hard pressed to beat this.The property is finished to a very good standard with a large kitchen & lounge,a lovely sunroom & well presented bathrooms.My wife & I thoroughly enjoyed our time here ,as did my 88 year old father. Lovely cottage with stunning views of the loch. Well equipped, comfortable and warm. quite a long way, however if you’re after peace and relaxation I couldn’t fault it. Tesco’s deliver which was great! Excellent location with lovely views of the Loch Awe, very peaceful and great customer service. We’ve had a brilliant time. 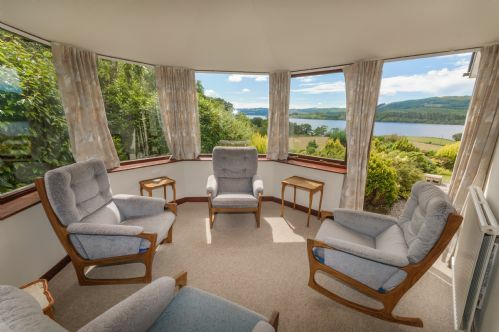 This is a great place to get away from it all - a lovely, well equipped, 3 bedroom bungalow with lovely views of the Loch. Catriona sent very helpful instructions (and ideas for where to go) and we arrived to a personal welcome and shortbread biscuits! The bungalow had everything we needed and proved a great place to stay, with a lovely garden surrounded by fields of sheep. We went for a walk over the farmland to the croft ruins on the first day and met the friendly neighbours in Barr-beithe Lower. The accommodation is remote which is part of it's charm but it only takes 20-30 minutes along the single track road to reach the main roads at either end of the loch. Although single track, there are plenty of passing places which are well marked, so we didn't run into any real difficulties. From there, we visited Inveraray and Auchindrain Settlement, Kilmartin and Crinan Harbour, Oban, Ardfern (to take a motor boat out to Coryvreckan) and we had a lovely walk on the Ardfern Peninsula, Cruachan Power Station, St Conan's Kirk and Kilchurn Castle. All in all, a lovely week in great accommodation - and the midges weren't as bad as we were expecting! 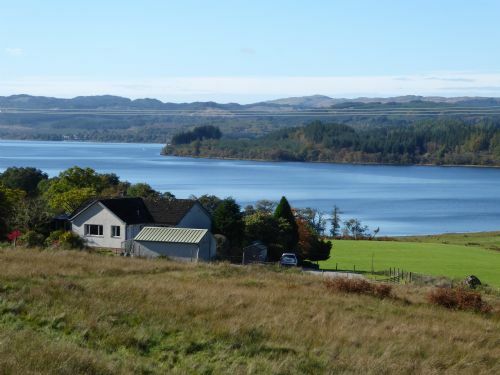 A beautiful cottage, set overlooking loch Awe, surrounded by farm animals and wildlife. We happened to have the 2 hottest weeks Scotland has seen and spent a lot of it just relaxing in and around the cottage and gardens. We watched Osprey fishing the loch, a Sea Eagle on the hills behind us, Swallows building nests and were visited by Pine Marten. Well equipped, clean and comfortable home, Catriona was friendly and welcoming and thoughtful. The one consideration is the single track road to get there, making journeys out a bit longer than we planned for. Would highly recommend. Very relaxing. Owners very helpfull. It was like home from home. Very good views. Good walks. Lots of wild life. 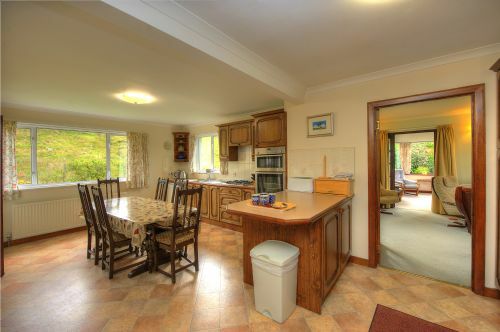 The location is superb with views of Loch Awe. Bathrooms have been upgraded - shower is powerful. Beds are very comfortable. Kitchen large and well equipped. Conservatory is comfortable with great views. picnic table. Although there is a TV we prefer to watch the changing scenery across the loch as the light and the weather changes. There are many great walks locally. This year we were blessed with really good weather so enjoyed eating outside a number of times. There is plenty of tourist information in the house so you'll surely find something to do. What a fantastic place to stay. The views are spectacular and the opportunities to see nature are in abundance, we saw osprey fishing across lake. We would highly recommend this cottage if you're looking to get away from it all and love nature. We stayed in Barn cottage for a few days in February. Our hosts Catriona and Martin were very helpful and welcoming on our arrival. The accommodation was comfortable, clean and very cosy. The local scenery is spectacular and we were so lucky to be able observe deer in close proximity to the cottage each morning. We were very fortunate with the weather (cold but sunny most of the time) and so spent much of our stay walking and visiting local attractions, such as the old town of Inveraray and the Crinan Canal, which has wonderful views out to sea. We would love to return, perhaps in the summer next time and spend more time exploring this wonderful area. We stayed at the cottage for two weeks, and were very impressed by the spaciousness and facilities. The kitchen is big, and the sun room is a great feature. Loch Awe is a beautiful location, and the cottage has excellent views of the loch. We found it perfect for a kayaking, cycling or walking holiday, and would love to return. We were really happy with the accommodation. The cottage was very comfortable with fantastic views from every window and the owner was very helpful. Nous avons quoiqu'il en soit été très satisfait de notre séjour. We found this property approx. 10 years ago and have been back just about every year since. We love it. The elevated position gives you unobstructed views of the loch and hillsides. It is so peaceful. There are walks everywhere. Inveraray with its castle and shops/petrol stations are a short drive away. Oban, the gateway to the Isles is an hour away. There are gardens and castles to visit all around (many National trust). The garden & views of Loch Awe from the property were stunning, it was spacious, clean, comfortable & we immediately felt at home there. A property i a magical location, with the best views and most tranquil setting of any previous holiday. The owner Catriona, was friendly and conscientious in making sure we had had everything we needed, but also respected our privacy. On arrival we found the place warmed up and a hospitality tray for initial tea/coffee, accompanied by some shortbread biscuits, for those arriving before grocery shopping. The property is a bungalow but it does have steps up entrances to negotiate. If you are after trendy/scandi-chic and have a need for a log burner this would not suit you, but if you are after a blissfully peaceful, well-equipped 'home from home' this is ideal. Barr-Beithe' is a few miles along a single track road away from the nearest main roads so you would need a vehicle, however it was also a 'nature ride' during which we saw deer and a red squirrel. The garden was always full of birds (feeders replenished) and the surrounding fields had sheep grazing in them, On clear nights stargazing was fantastic after stunning sunsets. The owner left tourist information leaflets and also a few books for guests to read including ones on Scottish birds and the Night Sky. 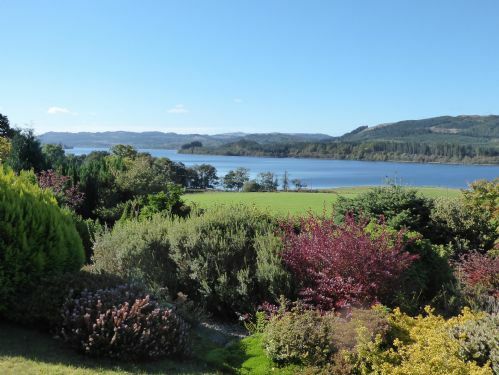 There is plenty to do and see all around the wider area but if you are happy just to enjoy the view of the loch, fields and waterfall at the bottom of the drive (seriously) there is no need to go far. We would return but stay longer than a week. This was a comfortable, well equipped cottage in a beautiful peaceful location over-looking Loch Awe. We only stayed a few days but enjoyed our visit to Inveraray, a lovely lunch at Tayvallich Inn and a stroll along Crinan Canal towpath. We're looking forward to going back next year. This was our second winter stay at Barr-Beithe Upper cottage, Loch Awe. We cannot fault the cottage and it's location with its' stunning panoramic views. Catriona has always been extremely helpful during our stays, whilst respecting our space and privacy. The cottage is extremely comfortable and very well equipped. We have no hesitation in recommending Barr-Beithe Upper and will inevitably return for another stay to recharge our batteries.